A dense fur is essential for many animal species to be able to survive in the wild. Their fur protects them from the cold and the rain and serves as camouflage. Unfortunately, as soon as people consider a specific type of fur to be particularly attractive, this blessing will rapidly become a curse. Hunting for fur has almost led to the extinction of many animal species. Others are held on fur farms, without the slightest consideration for their natural needs. On such farms, animals are just products – their only purpose being the production of fur. No one considers the creature behind it. Fur animals, however, are not fur-producing machines but interesting animals that have adapted wonderfully to their natural environments. Knowing about their natural way of life and their species-specific particularities makes it clear to anyone that living on a farm means unbearable torture. And everybody will understand the atrocity of animal traps where these creatures die a slow and painful death. 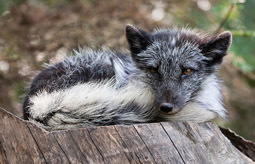 Please find on the following pages information on those animals kept most frequently on fur farms, their way of life, and explanations why their holding on farms or trapping is not species-appropriate.